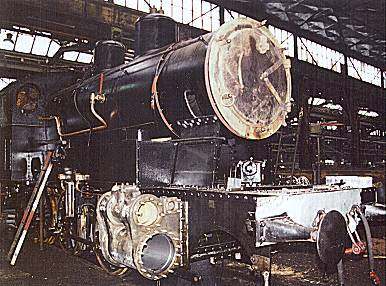 Steam locomotives being delivered to our company INTERLOK for overhaul often have incomplete or defect steam cylinders. Their repair requires a high standard of technical knowledge and abilities. It occurs that we have to construct and manufacture factory new cylinders. Reconstructing an O+K NARROW GAUGE LOCOMOTIVE for a German customer, we faced a highly corroded steam cylinder with a large hole on the outer surface. For it's reconstruction, we used the delicate surfacing by welding technology. Doing so, the cylinder was heated in a mould and kept in a constant temparature, and earthed. The welder used a special welding electrode fixed to a metal rod of about 2 meters length. Carefully, he built up circled weld layers from the outer edge of the hole directing to the center, until finally the hole was completely covered. The cooling down had to take place slowly, in a controlled manner over 48 hours. A water test proved the success of the repair. 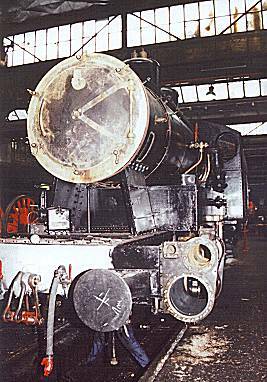 The second cylinder for this locomotive was manufactured completely new. 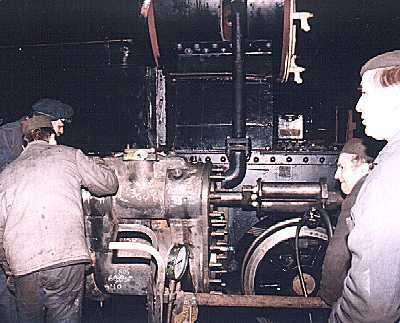 Fitting of new cylinders to the frame of a narrow gauge steam locomotive is demonstrated by the following photographies. In former times, bodies of steam cylinders were cast ones. Nowadays, INTERLOK manufactures them in welded construction. The reason is that old cast moulds are not longer available. It would be uneconomic to maintain a large stock of cast moulds for the mere eventuality that they might be once used in the future. Also, it would be uneconomic to manufacture new moulds just for one single order, though the manufacturing of moulds is possible and much cheaper anyway in Poland than in Western European countries. 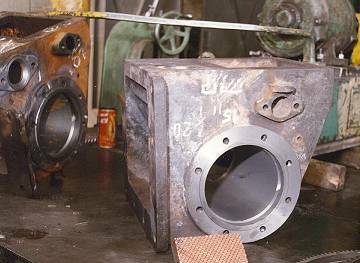 The technology of fabrication of cylinders in welded construction was developed during the 30-ies of the last century. 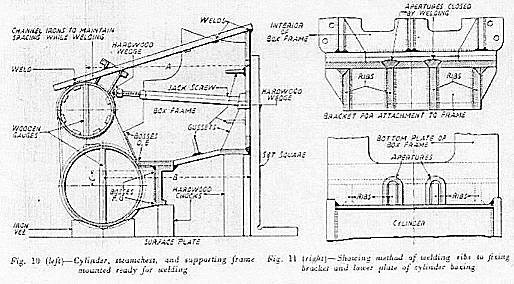 For example, the managing process engineer at French Railway Workshops at Périgeaux E.MONIER published a report on his new constructions of cylinders for the steam locomotive class 141 of P.O.-Midi-Railway in English in "RAILWAY GAZETTE", January 1938. The following drawing excerpted from that report indicates the high detailness of such a construction. The factory new built steam cylinders of INTERLOK also are the result of a complex fabrication process. The steam cylinders fabricated for the Swiss "Mittel-Thurgau" Railway - locomotive MThB Ec 3/5 -, for example, have a dimension of about 1 m³ cubature each and consist of 42 seperate components (the three following photographies by Ryszard Smulkowski). At the beginning, the cylinders have to be designed, calculated and constructed as seperate components. All planned welds have to be calculated mathematically according to the estimated working load. Each planned weld requires the description of a specific welding technology, what includes the definition of the used electrodes, or welding procedure, the thickness and chemical consistence of used steel, etc. The welding works are carried out seperately, it is the ready-made cylinder that is assembled to the locomotive frame. Directly after finishing the welding procedure, the new built cylinder has to be tempered in a special oven. This stress relieving process - also called "annealing" - is an important step in the fabrication. The cylinder as a whole has to be exposed to an equal warmth - as it would automatically be the case while casting a cylinder! - in order to prevent surface tensions. The cooling down proceeds slowly and controlled by programming the heat of the oven, according to the technological preliminaries. It is only after complete cool down that the cylinders are given the needed surface treatment (turning etc.). Finally, a pressure test is undertaken.